We've already seen the first theatrical trailer for Transcendence, the directorial debut of The Dark Knight and Inception cinematographer Wally Pfister. But there's another glimpse at the spring release coming later this week with a new trailer. Before we get to that though, the first poster has debuted, and while it relies upon star Johnny Depp by putting his name at the top, we're happy to see that his face isn't needed for the marketing campaign yet. All we see is the back of Depp's bald head with a bunch of wires plugged into his head, just as we saw him in the trailer. We're still not sure how this flick will be, but we're curious. 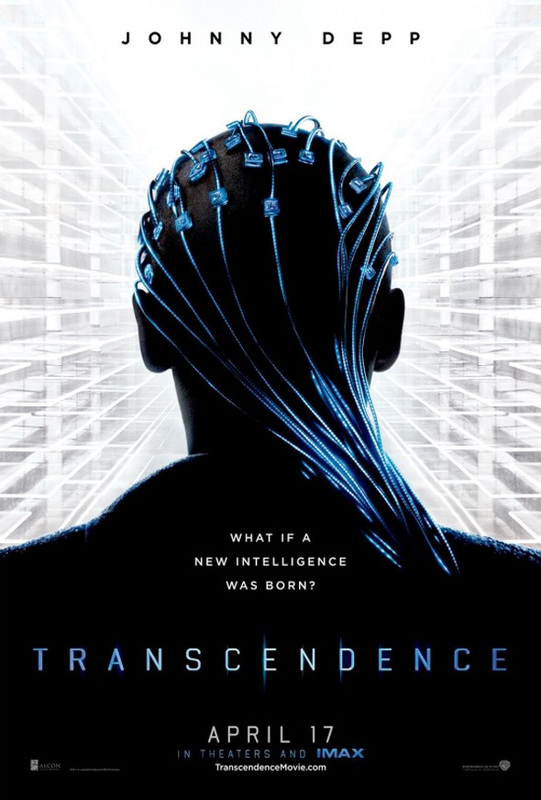 Transcendence is directed by Wally Pfister (cinematographer on Inception and The Dark Knight trilogy) and written by Jack Paglen, with rewrites by Alex Paraskevas & Jordan Goldberg. Dr. Will Caster (Johnny Depp) is the foremost researcher in the field of Artificial Intelligence, working to create a sentient machine that combines the collective intelligence of everything ever known with the full range of human emotions. When anti-technology extremists threaten his life, they inadvertently trigger a quick move towards his transcendence, and Will’s thirst for knowledge evolves into a seemingly omnipresent quest for power, to what end is unknown. Warner Bros will be releasing Transcendence in theaters starting April 18th. Well? I'm really not sold on this yet. I want to like it, but after that first trailer I just don't know... Here's to hoping the next trailer will convince me. Hmm, Why are you happy to say his face isn't needed for the marketing campaign? He's the star of the movie and the biggest name out of the cast. It's not that big names or stars aren't a worthy and marketable asset, but it's reassuring when that's not the only asset they seem to be counting on. This poster for instance, would sacrifice its mystique and the striking visual imagery if they had decided Johnny Depp's beautiful face was more important. It still has "JOHNNY DEPP" in big letters at the top and that'll do just as well. That's what I think he meant. Well that makes sense. Thanks for replying! It's because there is this myth that Johnny Depp is not a good actor and only sells his good looks to get an audience. Jacked in? Such a great use of words! I'm not happy that his beautiful face isn't needed for the marketing yet!